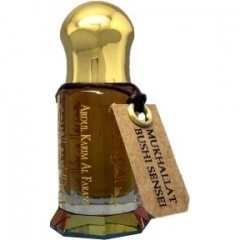 Mukhallat Bushi Sensei is a popular perfume by Abdul Karim Al Faransi for women and men. The release year is unknown. The scent is floral-green. It is still in production. Papaya, papaya and papaya, a blast of tropical vibe at the opening. Then it develop further, the japanese cherry blossoms and the aloe vera, give it a soft floral green nuance. In the end we a get a very tropical fresh mukhallat, with a touch of woody smokiness to it, not sure if it's from the oud, the black tea or both, but probably it's from the oud, compared to Abdul other attars we can trace his beautiful oud signature, woody with a small hint of smokiness, just beautiful. Wonderfull composition, and I usually don't like most tea fragrances. The first time I tried this, it was winter, I didn't enjoy it as much, the notes need a bit of warm (20º+ celsius) to really develop and shine. Longevity on my skin is not the greatest on this one (4 to 5 hours), wish it lasted a bit more, but the scent trapped within clothes will last a long time. Very safe, easy to like mukhallat, very tropical and fresh, best for warmer months. Unisex, leaning a bit more masculine in my opinion. Write the first Review for Mukhallat Bushi Sensei!